Team Jets captain Lauren Devine says she is unsure if the Jersey netball club could sustain another promotion. The Premier League Two side are unbeaten in their last five games and are six points off Worcester Reds, who occupy the final play-off place and travel to Jersey on Sunday. The club has won back-to-back promotions in the last two years. "A move up to Premier League One, I'm not sure if it's sustainable," Devine told BBC Radio Jersey. "It would be great, but we've got to think about the youth coming through, players going to university, things like that. "It would be fantastic, but I'll bide my time with that one," Devine added. 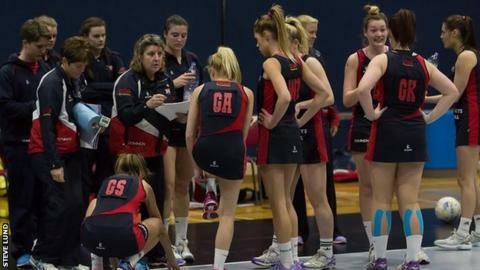 Jersey began their first season in the second tier of English club netball with five losses in their first six games, but have seen a pronounced upturn in form since. And Devine believes that poor start is one of the reasons for Jersey's upturn. "You need to lose games to learn things," she said. "We hadn't really had much experience of losing, we lost a couple last year but we found winning form quite quickly again. "It was about pulling together and playing to our strengths, we'd never had to really draw upon it to that extent before. "It was just that we were solid and it took that win for us to start believing in ourselves to turn it around, but it was a key turning point."